BIOFUND – Foundation for the Conservation of Biodiversity is an Environmental Fund, a not-for-profit institution under private law, which mobilises, applies and manages financial resources to the exclusive benefit of the conservation of biodiversity in Mozambique. It was set up following the norms of the best international practices, enshrined in the parameters of the CFA (Conservation Finance Alliance). In addition to its specific activity as a Conservation Trust Fund, the Foundation brings to the conservation effort in Mozambique the contribution of the private sector, the civil society and the academic world. Most of the public or private organisations linked to the conservation of biodiversity in Mozambique are members of BIOFUND. Environmental funds (often referred to as Conservation Trust Funds or CTFs) are private and independent institutions set up to provide stable, sustainable and long term sources of financing for the sustainable management of natural resources in area of high biodiversity. Without replacing the responsibilities of states, they help ensure a regular inflow of complementary resources necessary to achieve properly the management plans of the conservation areas. The first environmental funds were set up in the early 1990s and their number and importance has been growing since then. Currently there exist and operate, in various countries, more than 80 CTFs, mobilising about 800 million US dollars for conservation. The operational standards of these environmental funds are established and reviewed by the CFA (Conservation Finance Alliance), a voluntary international organisation which brings together NGOs, foundations, agencies, universities, governments and individuals. Some of the main activists of the CFA have collaborated with and supported BIOFUND since its creation. In Latin America and the Caribbean, 18 years ago the environmental funds set up a regional federation, RedLac, which has become the main international reference of the sector. With the support of RedLac, bilateral agencies and private foundations, African environmental funds in 2010 set up their own continental organisation, CAFE (in French Consortium Africain des Fonds Environnementaux). BIOFUND is a founder member of CAFE and has benefitted from its training seminars. In developing countries, the financing of conservation allocated by the state and by income from tourism itself is generally much less than the financial needs. This is expressed in a high degree of dependence on foreign sources. In Mozambique it is calculated that, in 2014, the contribution from the international community covered about 81% of the running costs of the national system of conservation areas. Although it is a useful injection of funds, this support is not distributed equally among the ACs. For example, between 2012 and 2014 only 5 ACs received about 95% of the value of the external support. Even for the most favoured ACs, although this support is significant, it is also a problem, since the sums may vary drastically from year to year, making it difficult to plan and to implement programmes. Taking into account that different donors generally support different aspects, and that these are not always well aligned with each other, the dependence on outside support represents a high risk for the effectiveness of the ACs, and a heavy bureaucratic and administrative burden. In this context the CTFs enter, as an alternative which can provide a stable and long term level of financing for the conservation areas. Thus, the CTFs develop grant and collaboration structures with the conservation areas and the national management network, including systems to monitor impact, and so they become very attractive for programmes of outside support for donors without a specialist team inside the country. The CTFs normally cover a capital fund, set up through one or more relatively large grants (from the State itself, from international organisations, from bilateral agencies and/or from private donors). This fund is then invested in the international financial market, following established prudential rules, so as to multiply the resources made available, thus conserving the value of the capital and using only the income from the investments to provide a reliable source of long term support for the management of the protected areas. What is their added value? One of the main arguments is that the funds are excellent instruments for financing the recurrent costs of protected areas. That is, costs of permanent monitoring, forest rangers, the maintenance of infrastructures and any other regular costs which can be budgeted for well in advance, and which donors typically do not like to finance, could be financed by the CTFs. A further focus considers the funds as the ideal tool for balancing the “capacity for financial absorption”, which is in a very limited state in many developing countries. The Foundation for the Conservation of Biodiversity was set up in 2011 after two years of preparation led by the Committee of Founders. This committee was elected by the Conservation Group – an informal body bringing together conservation activists, NGOs, representatives of cooperation partners and donors, and also representatives of state departments relevant to conservation. The activities of the Committee of Founders were financed by the Global Conservation Fund (GCF) of Conservation International (CI), by AFD, by German Cooperation via KfW, by WWF and, later, by the Global Environmental Facility (GEF) via UNDP, in the framework of the PROFIN project. 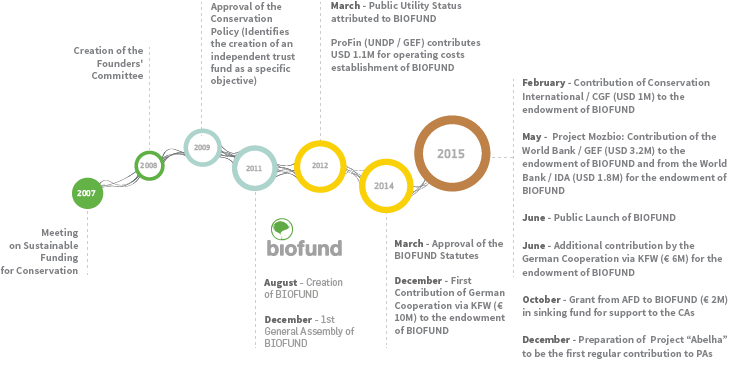 After it was legally established and consolidated as an institution, BIOFUND received contributions to constitute its investment fund (endowment) from German Cooperation via KfW (EUR 16 million) from GEF/World Bank (USD 3.2 million) and from CI/GCF (USD 1 million). Other important contributions to the BIOFUND endowment are still being formalised. In the Initial Phase (2011-2015) of BIOFUND, all efforts were directed towards Internal Organisation in order to achieve the first strategic objective. Effectively, the first step was to acquire the necessary technical capacity and the institutional solidity which would allow the foundation to carry out correctly the functions of a CTF. The positive assessment of BIOFUND, at the end of this phase, led the various partners to sign financial agreements which allowed the constitution of the investment fund (endowment). In the Pilot Phase (2016), the main activity was to test and adjust all the normative and action instruments before starting the regular financing of the national parks and reserves, in compliance with the 2nd strategic objective. In the current phase, the Operational Phase (2017 onwards), the development of the foundation, the expansion of its means of intervention and specific actions aimed at this are allowing attainment of the 3rd strategic objective together with the consolidation of the first two objectives.